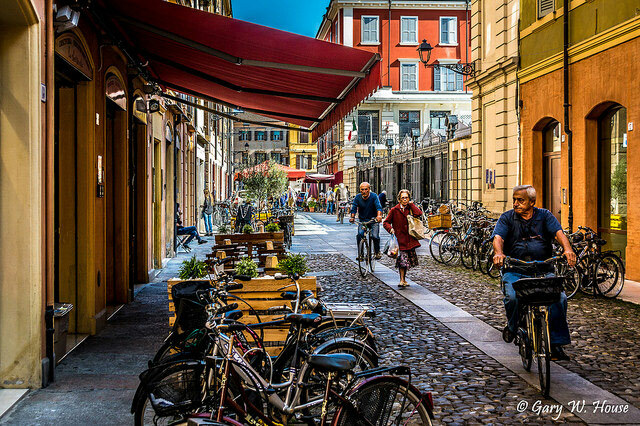 The idea for this article arose as I was reading the book Emilia Romagna – A Personal Guide to Little-known places Foodies Will Love brought to my attention by Zeneba Bowers, one of the authors of the guidebook, together with Matt Walker. 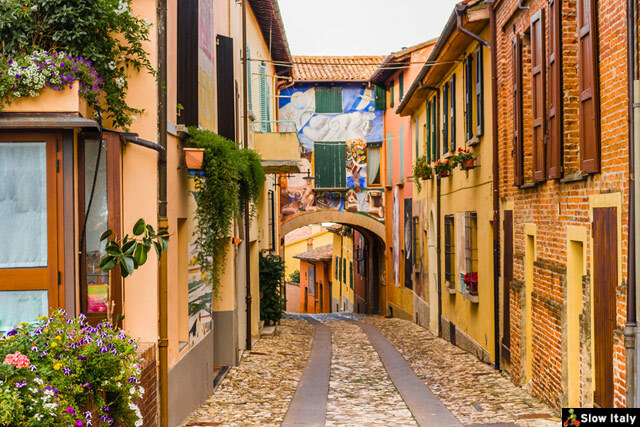 Often overlooked by visitors to Italy, Emilia Romagna is one of these authentic regions, rich in history, art and even expertise in a number of fields. 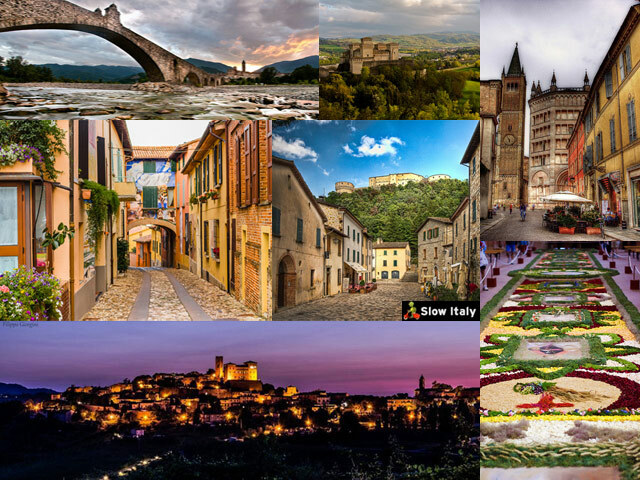 With its magnificent palaces, castles, churches and numerous UNESCO World Heritage sites, the region counts some of the most beautiful art and Renaissance cities of Europe. The region is also home to four of the world’s oldest universities and some world-famous automotive brands, such as Ferrari, Lamborghini, and Maserati, among others. Fontanellato. Photo by Giorgio Rodano. What made this book special in my eyes is that it is written by two professional classical musicians who, by definition, are finely tuned to the surroundings and the emotions of those around them. So, I was glad to find a travel philosophy close to the spirit and mindset of Slow Italy, looking for the real Italian experience, the one that is not usually described in guidebooks; a travel philosophy that celebrates peace, authenticity and timelessness, allowing time to have a great long lunch, to converse with locals, to explore a back street or an unexpected sight, to relax and breathe. In their professional life Zeneba Bowers and Matt Walker put a great deal of time and thought into finding new ways to bring music to the people, performing great but unusual pieces by little-known composers, and occasionally offering lesser-known works by the great masters. The authors applied the same principle to their travel philosophy, looking for more authentic, immersive and out-of-the-way experiences on their trips in Emilia Romagna. They take us down the far-flung little roads, deep into the countryside, visiting ancient towns and medieval hillside castles. They introduce us to the masterful artisans they met along the way, the great local taverne and osterie where to taste and try delicious in-house made bites and locally sourced products, and tell us about their unique lodging experiences. I also particularly liked the fact that their love for music transpires tangentially in their narrative, with references to Verdi, Teresina Burchi (a Sestola native who became a hugely successful opera star in the early 20th century) and the Museum of Mechanical Musical instruments, some of which might not have seemed worth mentioning to the typical guidebook author, but which add a delicious personal flavor to this travel book. Designed to allow you to go at your own pace, the foodie road trips can be completed in a couple of days or more, depending on the time available, or even be combined with other itineraries, such as a visit to one of the 9 Art Cities of Emilia Romagna. Without giving away too many of the goodies included in this book, here is a selection of 12 interesting sights (and foodie places) from the 6 foodie road trips suggested by the authors that resonated with my own travel experience and research. The photos and links have been added for your enjoyment only and are not part of the book. Legend has it that the Abbey was named after a white dove which indicated the perimeter of the monastery to the monks using pieces of straw. Abbazia di Chiaravalle della Colomba. Photo by Francesco. 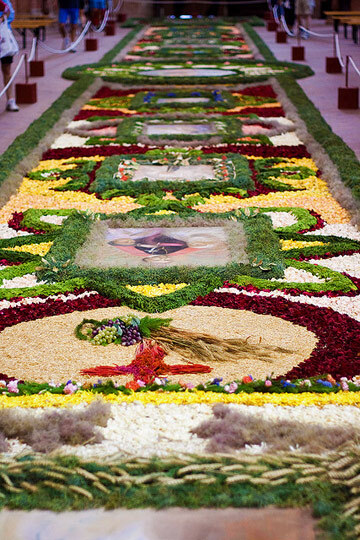 One of the reasons why the Abbey is famous all over Italy is for its Infiorata del Corpus Domini which takes place in May-June when a beautiful flower carpet is being laid out along the central nave of the Basilica. Verdi’s birth house in Le Roncole (Busseto). Photo © The Art Archive/Alamy 2011 via Operanews and Slow Italy’s Facebook page. 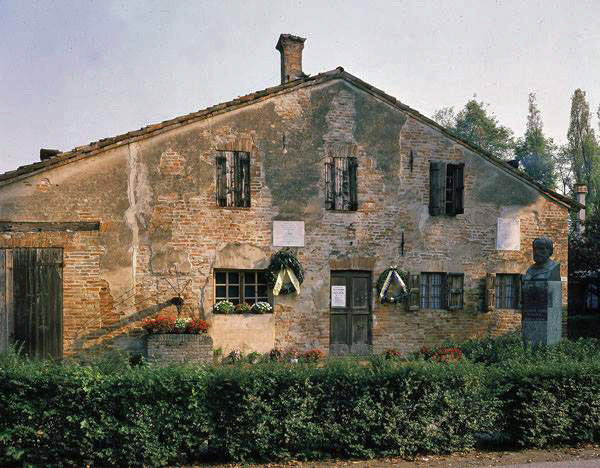 Verdi’s birth house in Le Roncole, a frazione in the town of Busseto. 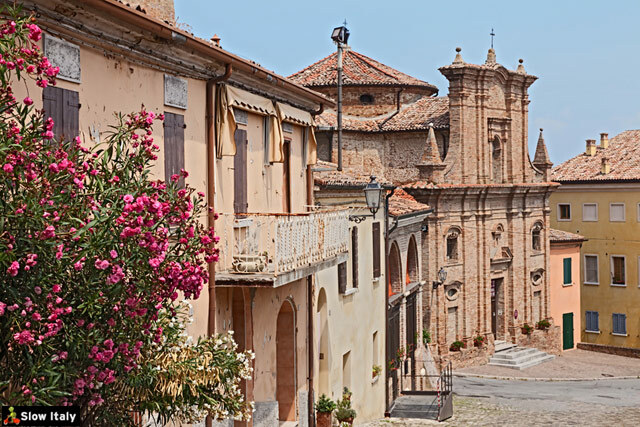 Today, the village is referred to as Roncole Verdi, in honor of the composer who was born there 200 years ago. The family home included a small osteria run by his parents, which was actually known as a posteria because it served at the same time as postal office, where mail carriages stopped and left off mail. 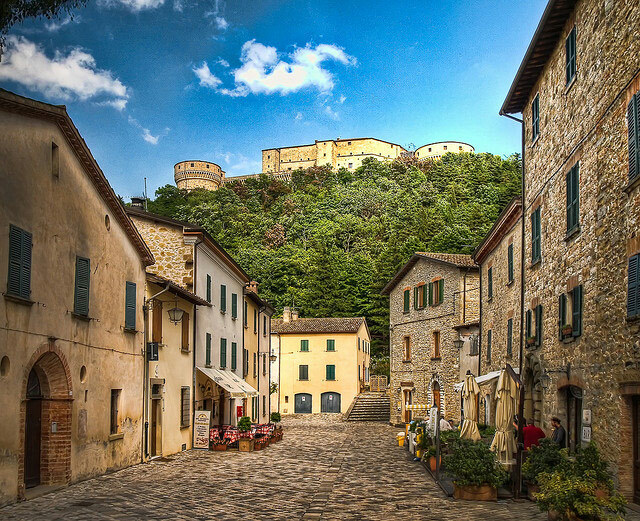 The colorful town of Fontanellato was built around the moated and fortified residence of the Sanvitale family, the Rocca Sanvitale, built between the 13th and 15th centuries. Bobbio is a lovely town in the Val Trebbia mostly known for its dramatic bridge surrounded by legends and folk tales, the Ponte Gobbo (Hunchback bridge). See also: Hunchbacks of Italy. Castell’Arquato with the collegiata Church of St Mary on the left and the Palazzo del Podestà in the background. 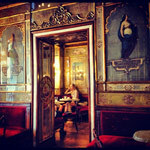 Photo by Maria Grazia Montagnari. Vigoleno is a small medieval hamlet, frazione of the town of Vernasca in the province of Piacenza. Its main attraction is its castle. 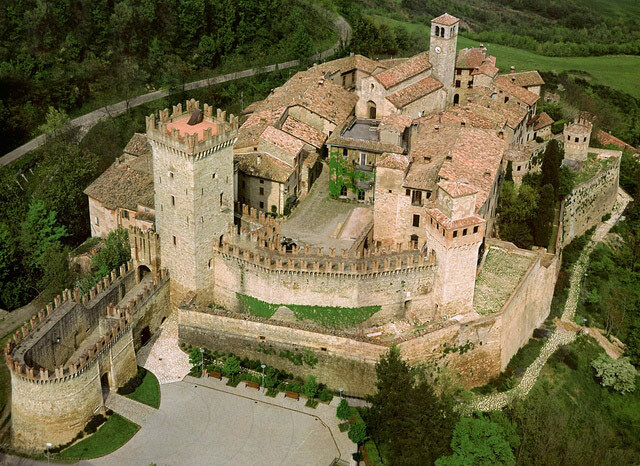 Built on the the hill of the same name in Val Parma, the marvelous Castello di Torrechiara was built by Pier Maria Rossi between 1448 and 1460. Originally designed as a defense structure, it also served as a noble residence for the Count and his lover Bianca Pellegrini da Arluno . 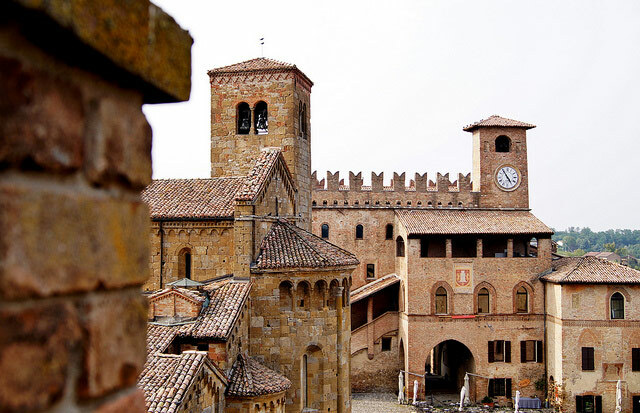 It is considered one of the best preserved example of castle architecture in Italy as it combines elements of the Middle Ages with those of the Italian Renaissance . Parma. Photo by Jakob Montrasio. Famous abroad for its prosciutto and parmigiano, Parma is much more than just the city of ham and cheese. See our article: More than just ham and cheese: hidden and historic Parma in 40 photos and a few anecdotes. 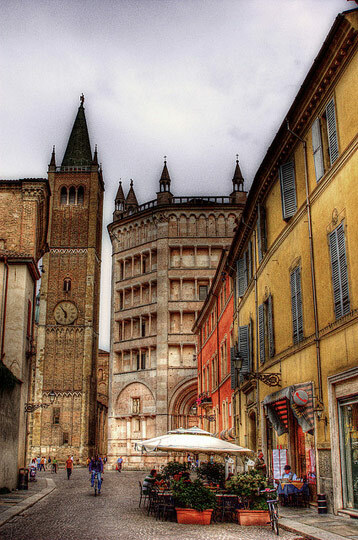 World famous for its balsamic vinegar, the town of Modena is also known as “the capital of engines“, since the famous Italian sports car makers Ferrari, De Tomaso, Lamborghini, Pagani and Maserati have or had their factories here or nearby. 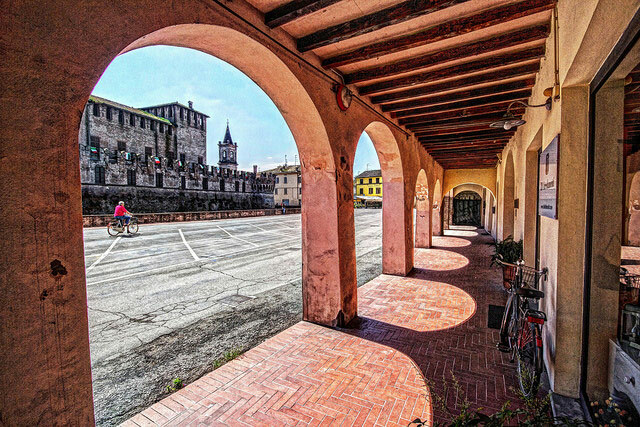 The town is also the birthplace of Luciano Pavarotti. Dozza is a litttle town situated between Bologna and Imola, known for its fortress (Rocca) and colorful murals in the picturesque historic center (borgo). More about Dozza. Originally part of the Marche region, the comune of San Leo was detached from the Province of Pesaro and Urbino to join the Province of Rimini in Emilia Romagna in 2006. 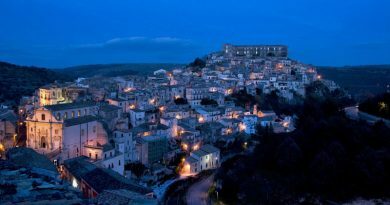 The town is famous for it large fortress, once owned by Cesare Borgia. 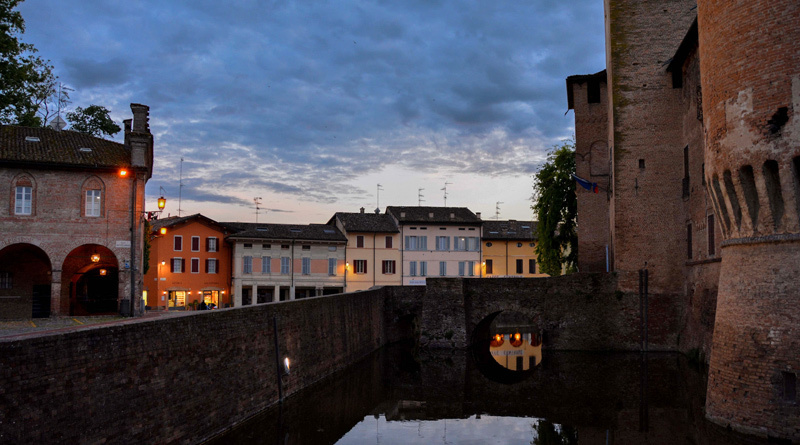 The lovely borgo medievale (historic hamlet) of Longiano with its beautiful castle (Castello Malatestiano) is located in the province of Forlì-Cesena. It is renowned for its Longiano dei Presepi (Christmas cribs) festival running each year from the second week of december to the last but one week of January. 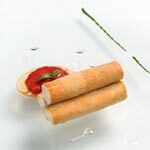 Longiano. Photo © Filippo Giorgini via Longiano dei Presepi’s page on Facebook. 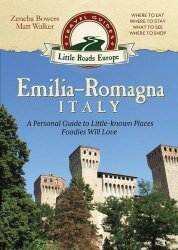 For more info about the 6 foodie trips in Emilia Romagna, see: Emilia Romagna – A Personal Guide to Little-known places Foodies Will Love by Zeneba Bowers and Matt Walker. Photo credits (from top to bottom): Fontanellato by Giorgio Rodano. Abbazia di Chiaravalle della Colomba by Francesco; Verdi’s birth house © The Art Archive/Alamy 2011 via Operanews; Fontanellato © FRANCO600D; Castell’Arquato by Maria Grazia Montagnari; Bobbio © FedevPhoto/Fotolia; Castlello di Vigoleno by Castelli e Borghi d’Italia via Turismo Emilia Romagna; Castle of Torrechiara © Carla Silva; Parma by Jakob Montrasio; Parma by Jakob Montrasio; Mercato Albinelli neighborhood in Modena © gwh.photography; Dozza © GoneWithTheWind/fotolia; San Leo by Anguskirk; Longiano © ermess/fotolia.